IMAGE: This is PPPL scientist Francesca Poli. Scientists at the U.S. Department of Energy's Princeton Plasma Physics Laboratory (PPPL) have produced self-consistent computer simulations that capture the evolution of an electric current inside fusion plasma without using a central electromagnet, or solenoid. The simulations of the process, known as non-inductive current ramp-up, were performed using TRANSP, the gold-standard code developed at PPPL. The results were published in October 2015 in Nuclear Fusion. The research was supported by the DOE Office of Science. In traditional donut-shaped tokamaks, a large solenoid runs down the center of the reactor. By varying the electrical current in the solenoid scientists induce a current in the plasma. This current starts up the plasma and creates a second magnetic field that completes the forces that hold the hot, charged gas together. But spherical tokamaks, a compact variety of fusion reactor that produces high plasma pressure with relatively low magnetic fields, have little room for solenoids. Spherical tokamaks look like cored apples and have a smaller central hole for the solenoid than conventional tokamaks do. Physicists, therefore, have been trying to find alternative methods for producing the current that starts the plasma and completes the magnetic field in spherical tokamaks. One such method is known as coaxial helicity injection (CHI). During CHI, researchers switch on an electric coil that runs beneath the tokamak. Above this coil is a gap that opens into the tokamak's vacuum vessel and circles the tokamak's floor. The switched-on electrical current produces a magnetic field that connects metal plates on either side of the gap. Researchers next puff gas through the gap and discharge a spark across the two plates. This process causes magnetic reconnection — the process by which the magnetic fields snap apart and reconnect. This reconnection creates a magnetic bubble that fills the tokamak and produces the vital electric current that starts up the plasma and completes the magnetic field. This current must be nurtured and fed. 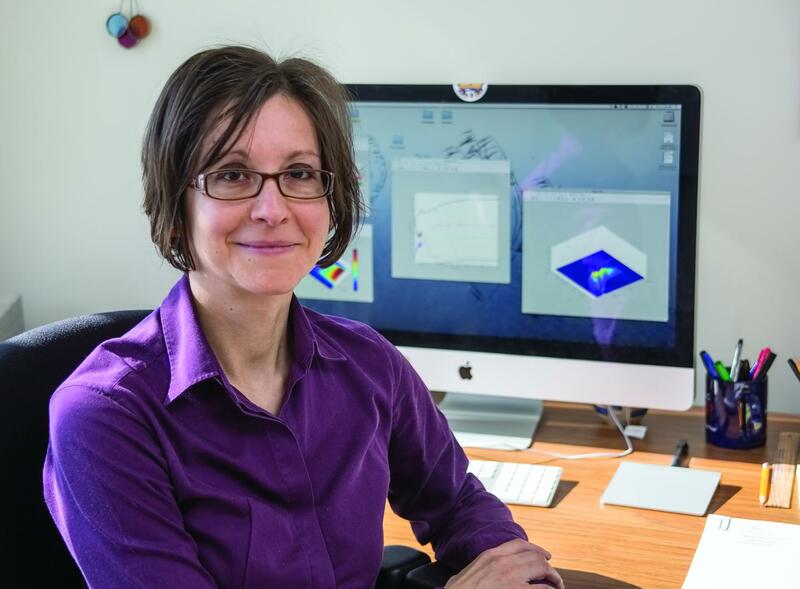 According to lead author Francesca Poli, the new computer simulations show that the current can best be sustained by injecting high-harmonic radio-frequency waves (HHFWs) and neutral beams into the plasma. HHFW's are radio-frequency waves that can heat both electrons and ions. The neutral beams, which consist of streams of hydrogen atoms, become charged when they enter the plasma and interact with the ions. The combination of the HHFWs and neutral beams increases the current from 300 kiloamps to 1 mega amp. But neither HHFWs nor neutral beams can be used at the start of the process, when the plasma is relatively cool and not very dense. Poli found that HHFWs would be more effective if the plasma were first heated by electron cyclotron waves, which transfer energy to the electrons that circle the magnetic field lines. "With no electron cyclotron waves you would have to pump in four megawatts of HHFW power to create 400 kiloamps of current," she said. "With these waves you can get the same amount of current by pumping in only one megawatt of power. "All of this is important because it's hard to control the plasma at the start-up," she added. "So the faster you can control the plasma, the better." PPPL, on Princeton University's Forrestal Campus in Plainsboro, N.J., is devoted to creating new knowledge about the physics of plasmas — ultra-hot, charged gases — and to developing practical solutions for the creation of fusion energy. Results of PPPL research have ranged from a portable nuclear materials detector for anti-terrorist use to universally employed computer codes for analyzing and predicting the outcome of fusion experiments. The Laboratory is managed by the University for the U.S. Department of Energy's Office of Science, which is the largest single supporter of basic research in the physical sciences in the United States, and is working to address some of the most pressing challenges of our time. For more information, please visit science.energy.gov.